These are obscenely chocolate, and fit only for those who have some serious chocolate addiction. 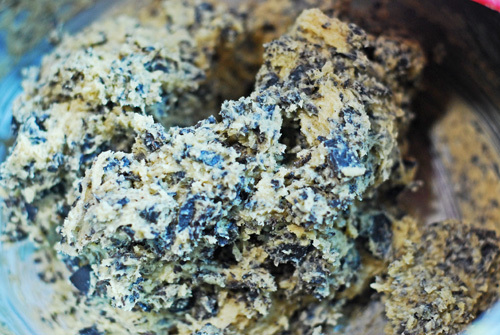 If you love the cookie part more than the chocolate part in chocolate chip cookies, then sorry !!!! THIS IS NOT FOR YOU!!! 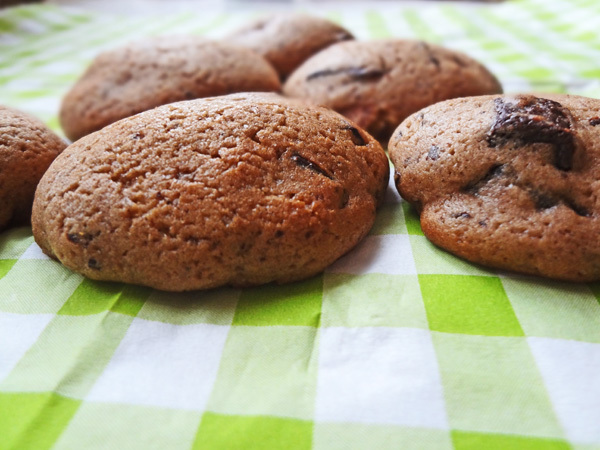 but if you love chocolate chip cookies not for the faint cookie base, but for its rich chocolate taste, then THIS IS FOR YOU and WELCOME TO THE CLUB! are you reading these caps while shouting out the words? sorry I didn’t mean to be weird and mean, but I’ve had 2 of these babies and Im feeling strangely buzzed. Perhaps it’s all the chocolate or perhaps its all the chocolate. I don’t know.. These are the delicious, fattening, pant tightening, addictive, chocolate oh yeah they’re chocolatey and you might want to go to the chocholics anonymous.. But if you make them, you will make them again and again and eat them and thank me. I’m serious. One of the biggest reasons I made them is also because I happen to have a lot of chocolate on me now.. seriously good chocolate. The kind of chocolate you’d want to eat in heaven..but getting back to these cookies..
You need flour(mixed with salt and baking soda), butter, sugar both white and light brown, egg, vanilla and obscene amounts of chocolate. Do you see that fat bar of chocolate.. yeah that amount.. Cream the butter for a minute. make sure it’s room temperature. 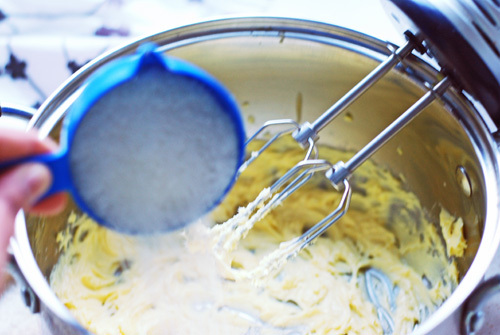 You don’t have to use mixers for this. A wooden spoon would suffice, but for these majestic cookies I brought out the big guns. Add the egg also at room temperature. You don’t want to put in anything remotely cold from the fridge okay? 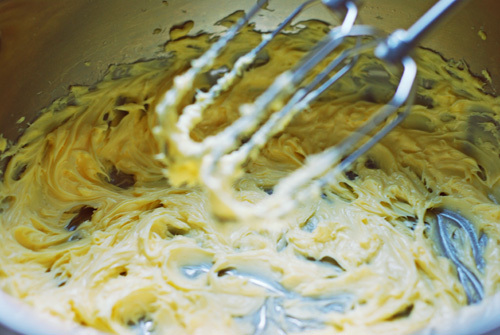 Beat some more to mix in the egg and vanilla and let it look like this. In with the flour. I have already mixed salt and baking soda right into the flour.. I’m a visionary.. yes I am.. ok I’m not. 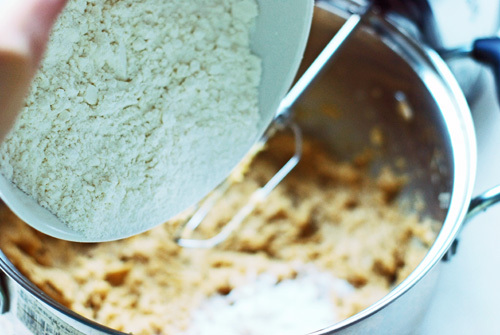 Mix it again for a minute or until the flour is barely incorporated. You don’t have to mix it within an inch of its life. This is a step where you can easily use a spatula or a spoon. My favourite part. Dumping in the chocolate. See I wasn’t kidding about it at all.. It’s a lot of chocolate. This is the dough that will eventually make cookies. It’s more chocolate less dough, just the way we like it aha aha. Now refrigerate for half an hour. 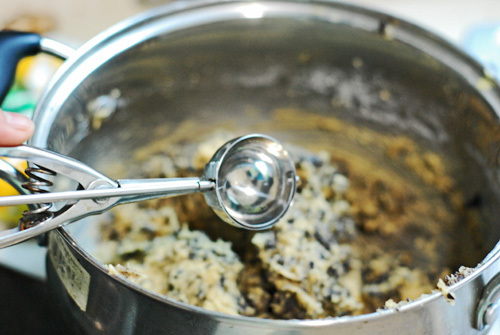 Once out of the fridge, use an ice cream scooper to scoop out even sized cookies. Onto a sheet lined with parchment paper,line the cookies. These spread quite a bit so space them out more than an inch apart. Look at these.. just look at them. 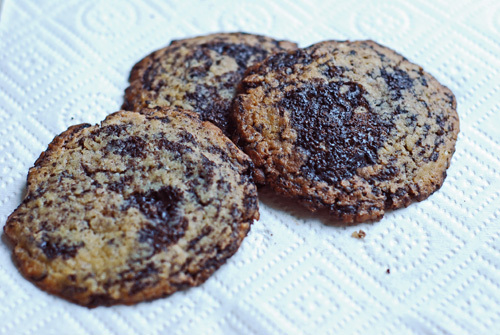 Every bite is sinfully good, seriously chocolatey and oh my god. It is not for the faint of heart but if you like your chocolate a lot then this is one of the best things you could make with them. Go on.. Make it already.. seriously you have to.. Enjoy!! 130 gms good quality dark chocolate. Either chocolate chips or chocolate bars cut into pieces. 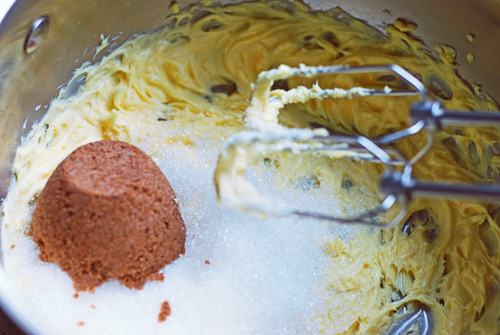 Recipe – In a bowl sift the flour, salt and baking soda, mix well and keep aside. 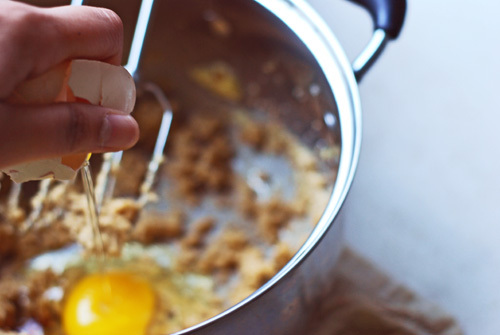 Begin with beating your butter which should be at room temperature for about a minute. Either with a mixer or a spoon or spatula until a bit light. Add in the sugars and beat again. crack in the egg, add the vanilla and beat for a minute or so again. Add in the flour and beat until just incorporated. You don’t want to overmix at this point. 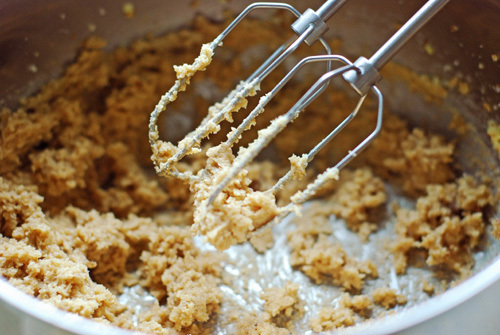 Now taking your spoon or spatula, scrape the sides of your mixing bowl and stir to mix in any stray bits of flour or sugar. 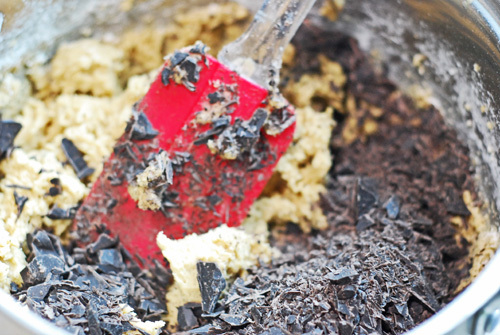 Now tip in the chocolate pieces and mix until the dough is flecked with chocolatey rubble. 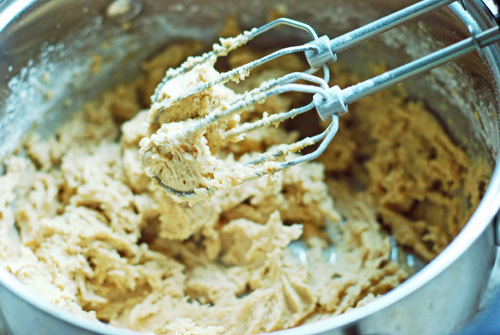 Refrigerate this dough for half an hour. For better results let it go in for 3 hours. 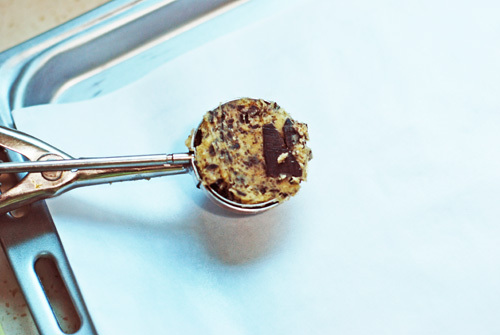 using an ice cream scoop, scoop the cookie mixture on a baking sheet, lined with parchment paper. Make sure there is enough space between ech cookie since they spread out. Bake at 180℃ for about 12-15 minute or until they brown a bit at the edges. NOTE You have to let these cookies rest on the baking sheet for at least 15 minutes or they will break when you transfer them on a wire rack to cool. These are very soft and gooey when just out of the oven. Wait for them to firm up slightly. Enjoy with a tall glass of milk or senseless television.. Very easy, nothing much in the way of too much work. Grab your mixer, either hand or stand.. assemble ingredients and its just a matter of putting in everything one after another. 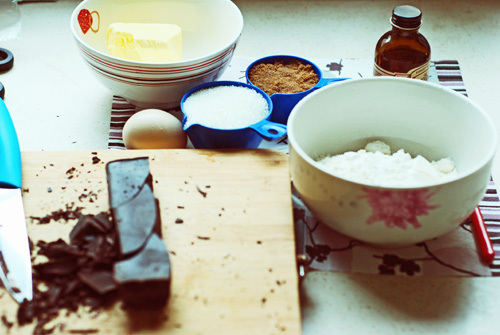 First things first: In a separate bowl mix the cocoa with the flour and set aside. 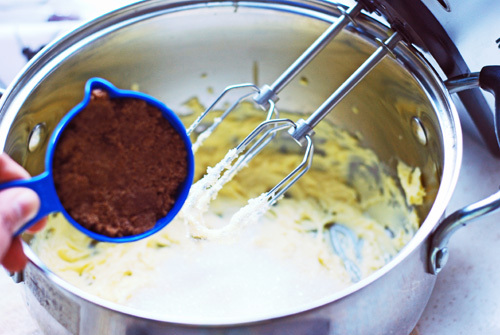 In the bowl of your electric mixer beat butter and sugars until light and creamy and gorgeous. Beat in the egg and mix until well incorporated. 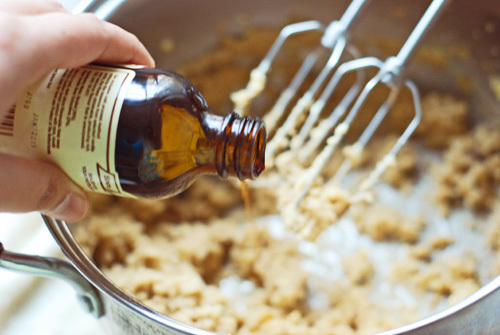 Add in the vanilla extract and combine everything beating well. 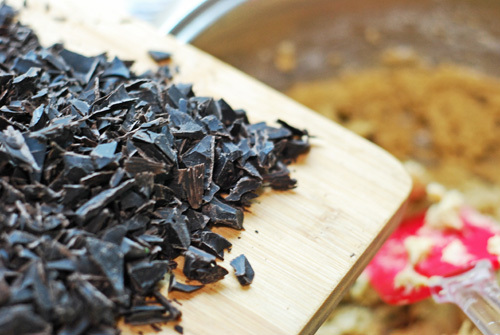 Now slowly add the dry ingredients without making a mess if possible (flour+cocoa). and beat it all together, slowly adding in the chocolate chips too..
Refrigerate the dough for a while- 20 minutes should do it. Allow to cool on a wire rack and dig in. 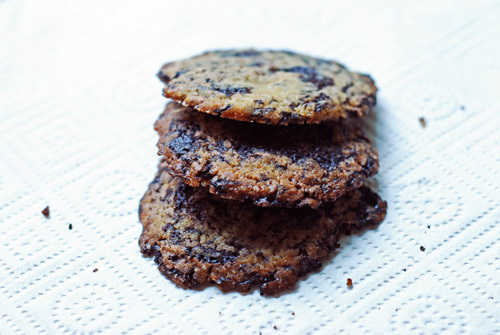 This recipe made me around 2 dozen cookies.. it can vary according to the size you decide to make. 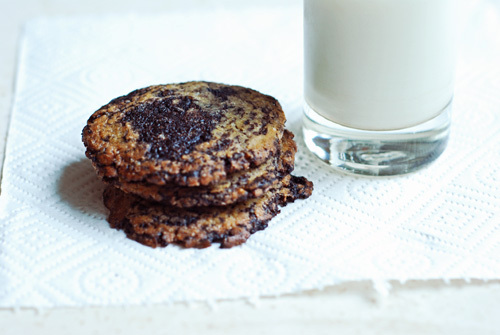 All in all, these are easy, delicious and devoured immediately..